The 150 grain #2130 has the Sierra's unique double-tapered hunting jacket that has been field proven under all conceivable conditions. The 150 grain #2130 bullet is best suited to medium game. This bullet is extremely accurate, providing an undeniable edge in the game fields. Reliable expansion and deep penetration blended with Sierra's classic Spitzer flatbase profile makes these the bullets of choice with many 30 caliber riflemen. 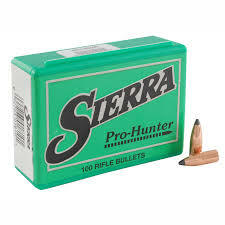 For handguns, Sierra's Pro-Hunter design is generally considered too "hard" for all but the most powerful of the 30 caliber handgun cartridges. Handguns chambered for the 308 Winchester cartridge or cartridges of similar size can use these bullets over maximum hunting loads at short range. Due to their flat base design, Pro-Hunter bullets are an excellent choice for a cartridge with limited powder capacity and a short neck, because these bullets intrude into the powder space less than a boat tail.